On November 15, New Village Press Director Lynne Elizabeth and Director of the Center for the Living City Stephan A. Goldsmith received the 2010 Jane Jacobs Urban Communication Book Award for What We See: Advancing the Observations of Jane Jacobs. Elizabeth co-edited the work, and Goldsmith lead-edited as well as initially conceiving the book to honor the late Jane Jacobs. Urban Communication Foundation, a non-profit that promotes and supports research in urban communication, presented the award at the National Communication Association annual conference in San Francisco. A reception was held at Johnny Foley's Irish House on 243 O'Farrell Street. 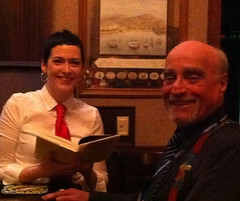 Cathi Murphy, bartender at Johnny Foley's, reads a copy of What We See. Pictured with Gary Gumpert, President of Urban Communication Foundation.